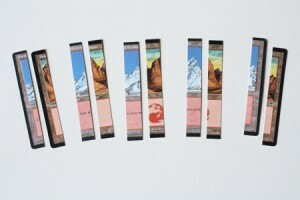 My friends and I have been playing a lot of Magic over the last few months. For those who don’t know, it’s a highly addictive fantasy-world card game that encourages you to buy way too many bits of beautifully decorated, heavyweight paper. Ie: cards. Not only have we all been buying a lot of cards, my friends have also been sent a bunch of free Magic stuff from various people. So there are a ton of these little bits of pretty paper floating around. Far too many to use at once. What’s the most practical thing to do with pretty leftover things? Craft! 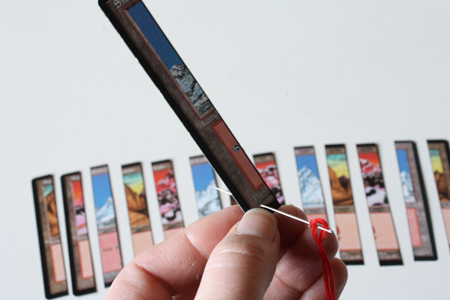 In combination with the Christmas season, I’ve taken to making ornaments out of some of the less valuable, more common Magic cards. 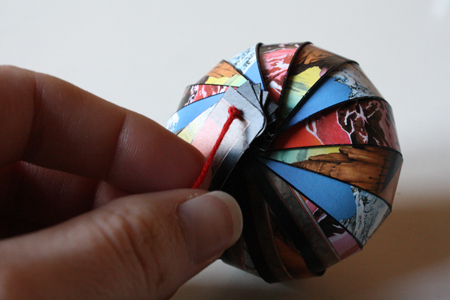 These paper ornaments are pretty, elegant and very inexpensive to make, and you can make them out of pretty much any paper, not just Magic cards. They make lovely decorations for your tree, or simple handmade items to give as gifts. 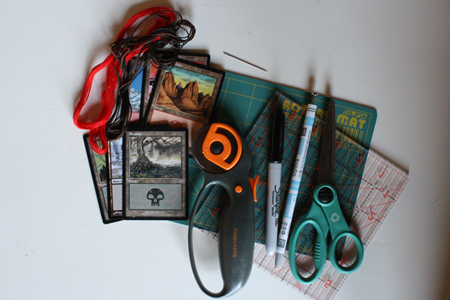 paper – Magic cards (or any playing cards) happen to be a perfect size for this, but you can also use scrapbooking paper, magazine covers, etc. Old greeting cards can make beautiful ornaments. 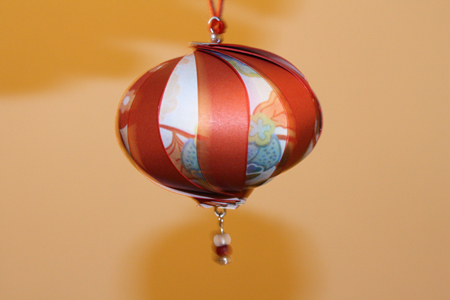 It’s best to use pretty thick paper, of cardstock weight. 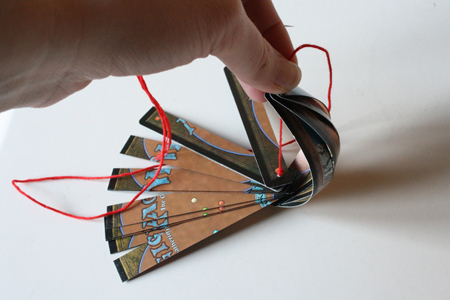 0) Magic cards are the perfect size for this project, and for this tutorial I’ll be giving you instructions based on making ornaments out of Magic or other playing cards. 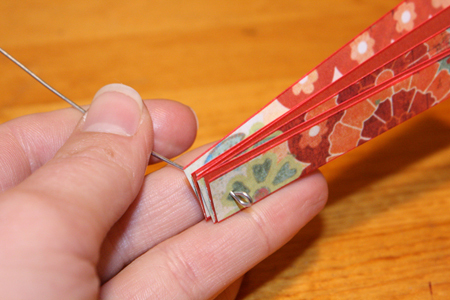 To follow these instructions with other papers, cut strips that are 3.5 inches high and .5 inches wide. 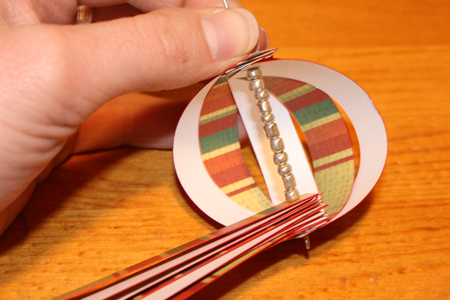 You’ll need 14 to 16 of these strips for each ornament, depending on the paper and how exact your width measurements are. You can use the same paper all the way around, or use 2 or 3 different papers. You can also make smaller or larger ornaments, by cutting taller or shorter strips of paper. 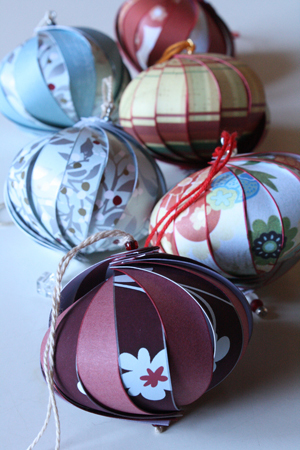 Just be aware that for smaller ornaments you’ll need fewer strips, and for larger ornaments you’ll need a larger number of strips. 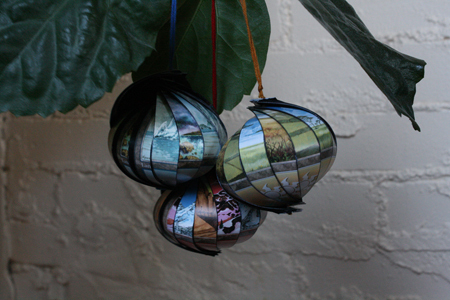 1) You’ll need three Magic cards for each ornament. 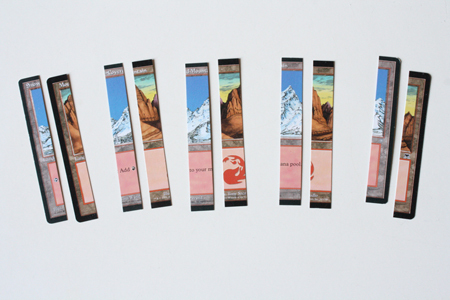 I’ve used old land cards, which turn out looking really nice. 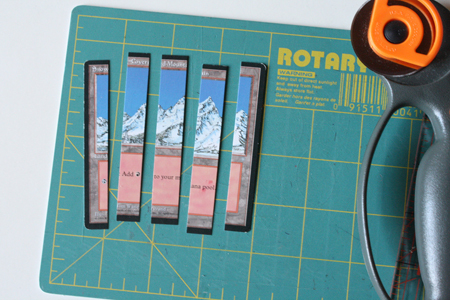 Cut each card into five vertical strips that are each 1/2 inch wide. 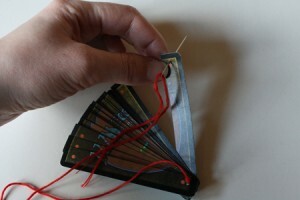 2) Lay the strips of the first card out in order, with large gaps between each piece. 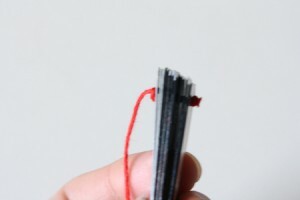 3) Lay the strips of the second card next to these pieces. Lay the strips of the third card in the remaining spaces. 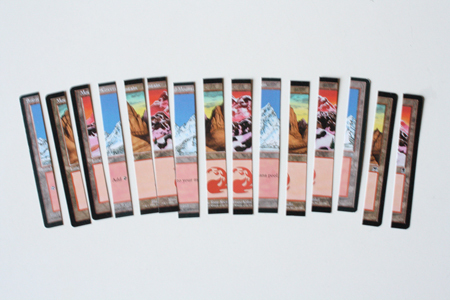 Your layout should look like this, with a strip from card 1, a strip from card 2, a strip from card 3, then another strip from card 1, and so on. 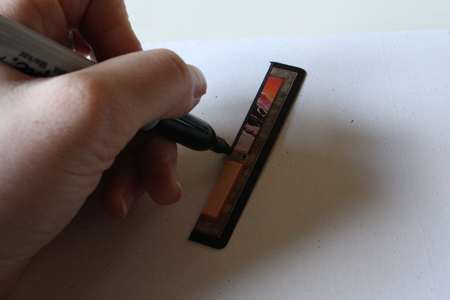 4) Optional step: Use a permanent marker to draw a thin line along the vertical edges of each strip. I think this gives the ornament a more finished look. You do this simply by bumping the tip of the marker up against the edge of the card, and pulling the marker along the edge. You’re essentially drawing a line beside the edge of the card, while also creating a narrow line on the card’s exact edge. You’ll need a piece of scrap paper underneath the card for this, obviously. I use this technique for nearly everything I make out of paper. It adds a nice clean visual edge to things. 6) Take the first card strip and pierce it with the needle at the bottom of the strip, on the front side. 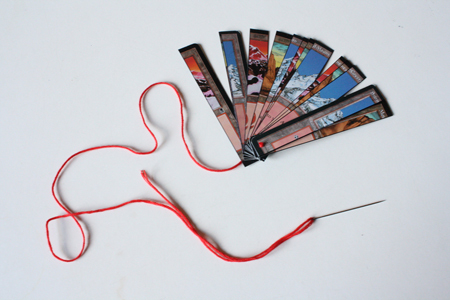 String it onto your thread. 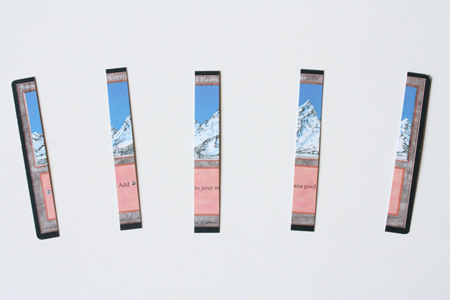 7) Repeat step seven with every card strip, in order. Flip the strips over so you can see their back side, and tie a knot in your thread as closely as possible to the last strip of paper. There should be a knot on either side of the stack of card strips. 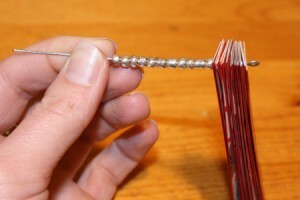 9) Take the strip on the bottom of the stack, and pierce it from back to front with the needle. String it on and push it down so it curves outward into a half circle shape. 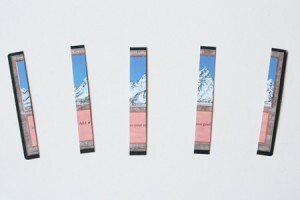 You want the top end of each strip to be on top of the strip before it, not below or beside. 11) When all the strips have been strung on, you will have a spherical ornament, with a spot on one side where the strips meet up that’s slightly open and uneven, like a seashell. Push the top down as much or as little as you wish to create a flatter or a more oblong shape. Then, keeping the strips in place by pushing down with one hand, tie a knot in your thread as close to the top end of the ornament as you can. 12) Make a loop with your remaining thread and tie a knot in it, again close to the ornament. 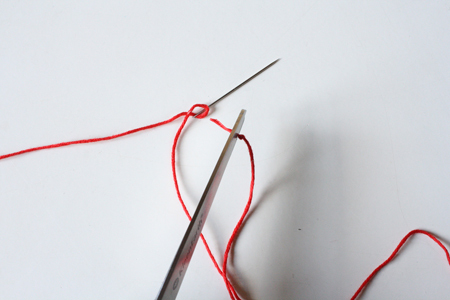 Trim any excess thread. Note: You can also make these ornaments with wire on the inside, which allows for more easily and elegantly hanging beads from the bottom. 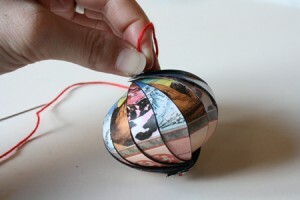 You’ll need some needlenosed pliers for this, plus wire and extra beads. You’ll also have to use a needle to poke holes in the tops and bottoms of all your card strips ahead of time. Make a loop in the bottom of the wire, then follow steps 6 and 7 to string all the card pieces onto the wire. Then, since you can’t tie a knot in the wire to keep the strips in place, place a line of beads on the wire. 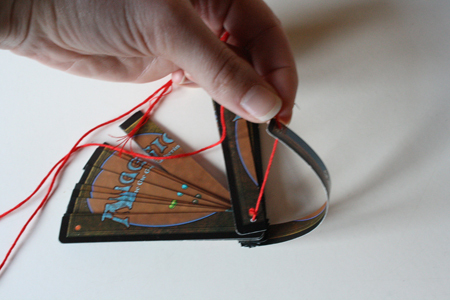 Next, follow steps 9 and 10 to string the tops of the cards onto the wire. 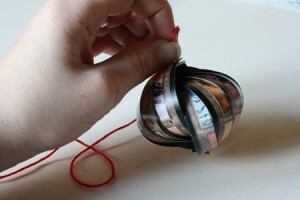 When this is done, use your pliers to make a loop at the top of the ornament, and cut off any excess wire. 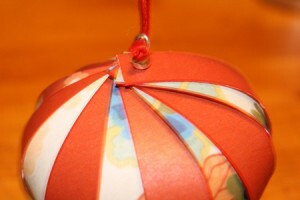 Add a string for hanging, and dangle beads from the loop on the bottom of the ornament. 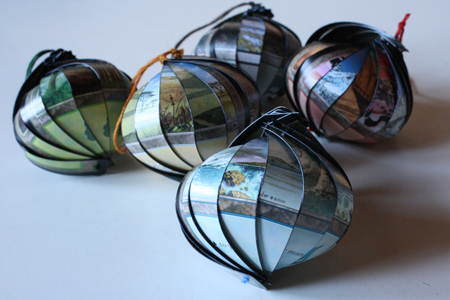 I’m going to try these with Pokemon cards for holiday gifts! Thank you so much for the inspiration and tutorial! Just made a bunch of these with my sister! I, not being a sower, stabbed myself in the finger about 20 times with the needle, but it was so worth it! These are fun to make and can decorate you’re room, living room, or make a great Christmas present that doesn’t break the bank. I love them! 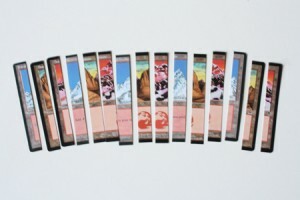 Oh, this is just lovely… I have about 30,000 magic cards that are completely worthless (how many shadowing and beast cards does one girl need?!) I think this year, my christmas tree shall be magic themed… And the nerd in me is ecstatic and excited now to begin this project… and for christmas to get here… bahaha! Beyond excited to find this tutorial! 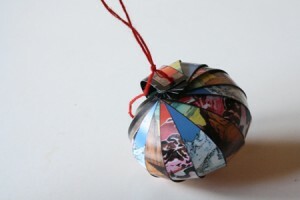 I just made 4 of 8 ornaments using Buffy trading cards for a Whedonverse ornament exchange. I have been browsing online greater than 3 hours today, but I never discovered any attention-grabbing article like yours. It is pretty worth enough for me. In my view, if all website owners and bloggers made just right content as you probably did, the internet might be much more helpful than ever before.